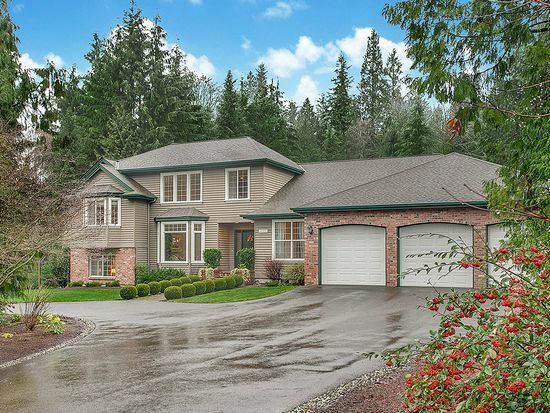 Stunning 1997 Custom Home in Sought-After North Wellington ~ 4,400 asf of light, bright OPEN-concept space features a true “heart of the home” w/massive island kit. w/quartz counters & tons of cabinets adjacent to fam rm & breakfast nook. Two story living room w/floor to ceiling windows, fully updated 5-piece master bath, lofted office, 2 bonus rooms & large mudroom. 4-car gar. or 3 spacious bays+huge shop. PRIVATE, level, tranquil grounds! No CCRs, Northshore SD + SNO County Tax. Welcome Home!